I've always been an artist and a photographer. Got my first 35mm interchangeable lens camera when I was really young. Learned the technique of film capture, developing and printing in the traditional darkroom of the late 1970's. It wasn't until quite a bit later in life that I began to really appreciate the outdoors. Growing up in the Pacific Northwest you tend to take it for granted. Traveling, hiking, backpacking, climbing in the late '80s and early '90s, I became serious about capturing the rare moments I've seen in the wilderness when light and weather combine with other natural elements to create a transformative image. It became my life's greatest pleasure to seek out and photograph strange and beautiful moments to bring back and share. I try to do justice to nature's incredible gifts by doing the work to render what is offered respectfully, elegantly and, at times, dramatically. During my lifetime I've witnessed an incredible evolution in the art of photography. The greater control over everything from processing of raw material, from scans of film to full digital capture, and the ability to produce high quality, long-lasting prints have been watersheds for me. Over the years I've developed a certain way of approaching a subject and some very definite ways of processing. I very much try to take the viewer through the scene by choreographing the composition thoughtfully and with purpose. Of course some will appreciate what has become, for better or worse, my style. Some will not. That's cool. I maintain my integrity with everything I do and try to be honest and considerate. I've produced and sold my own prints for years to clients worldwide through my website, at art shows and events, and in gift stores mostly in my home state of Washington. I sell licensing for my images on a rights-managed basis. Please note that I hold the copyrights for all of my images and protect them aggressively when I have to. I'm in this mostly because I enjoy having success doing something I love. I don't do workshops, webinars, weddings, or tweet or post anything of significance regularly. I reserve the right to change my mind. Probably not about the weddings. 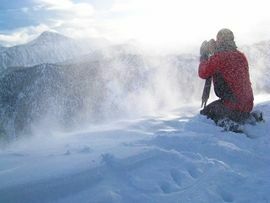 I've been published worldwide, including in National Geographic, Outdoor Photographer and Time/Life publications. I've earned the unintended distinction of having many of my images pirated off the internet and used widely for many unauthorized purposes and in various countries. I don't belong to many organizations, but I've been a member of the North American Nature Photography Association, NANPA, since 2007. My images can be found with various awards in every NANPA Showcase competition and Expressions publication since. I believe conservation of our natural heritage should be the priority of everyone who loves it and relies on it to do what they love. Please help preserve our wild natural lands. Support artists you like because they need it to continue to do work of value. And please leave the wilderness pristine for the living things that depend on it. More info about images, prints, licensing, orders? Want to display framed fine art prints for sale in your Seattle area business location?